Long Tail Pro is a complete SEO desktop software solution for niche marketing. It runs perfectly on Windows and Mac computers and doesn’t need any technical skill to work with it. When talking about SEO tools or keyword research tools, Long Tail Pro is a handy SEO software which can help grow our businesses. Two of the most challenging parts of search engine optimization are increasing the SERP rankings of targeted keywords and drive more organic traffic. AS my experience in the past few years, I have found that a proper keyword strategy couldn’t want backlinks anymore to increase SERP rankings. I explained it in this blog post which explains how to increase SERP rankings by improving CTRs. The successful keyword strategy comes up with the quality keyword research tools. As the list of my favorite and best keyword research tools for blogging, LongTail Pro keyword research software takes a vital placement. I have been mentioning about the Long Tail Pro tool on different posts such as Tumblr SEO, Blogger SEO techniques, reduce bounce rate, etc. But, I couldn’t review Long Tail Pro tool here at Pro Blog Tricks. So I thought today is the best day to write a Long Tail Pro Review post. I know there are lots of Long Tail Pro reviews. But, I think that you could find lots more information about LongTail Pro software from this comprehensive Long Tail Pro review. As usual, just like other reviews, today I have got a special gift for you. If you are convinced the importance of having LongTailPro (I know you’ll), I will provide you a Long Tail Pro discount at the end of this review of LongTail Pro. So don’t forget to check out the bonus section. For people who don’t know what exactly the LongTail Pro is, let me explain briefly about the LongTail Pro tool. Long Tail Pro is a compatible desktop SEO tool which runs on Windows and Macintosh computers. Spencer Haws and his team developed the LongTail Pro (LTP) to solve a need in the marketplace to find niche keywords with low competition, which are profitable and can be ranked on search engines very easily. As an SEO and a blogger (or even a content marketer), one headache problem is finding low competitive profitable keywords which convert like a breeze. Fortunately, Spencer Haws built up this nifty SEO tool for desktop users. That means you don’t need to open up your web browser every day and login to other online services to find niche keywords, analyze competitors’ websites, find keyword competitiveness scores, etc. Once you have installed the LongTailPro or Long Tail Pro Platinum software on your personal computer, other things become very easier. As LongTail Pro is a premium SEO tool, you may think that is there anyway to test LongTail Pro before purchasing its premium versions. Actually, you can test drive Long Tail Pro for next 10 days free using this link. But LTP Basic SEO program has minimum features compared to other packages. How Long Tail Pro Works? To run Long Tail Pro on your computer, you should have installed the Adobe-air which you can download from here. Once you have downloaded and installed the Adobe-air, you can go to LongTail Pro page over this link and download LongTailPro along (Free Trial) or buy Long Tail Pro with the coupon link at the bottom of bonus section. It sizes only 7MB or less. Some tools such as Competitor analysis to be working, you should provide your SEOMOZ API key. And providing the access to your Google Adwords is important to generate more long tail keywords. This SEO tool is just more than a keyword research software. It comes with versatile tools to do many SEO activities. Here are a few features of Long Tail Pro. Create unlimited projects: Projects help you organize your SEO activities. If you have multiple niche websites and blogs, you can create multiple projects for each website. Or create custom projects for each blog post you create, so you can track results later with the Google webmaster tools keyword data. Isn’t that cool? Export Keywords: You can export your researched keywords projects from Long-Tail Pro to an excel sheet. It just takes a few seconds only. Import Keywords: Do you already have keywords, but want to analyze their keyword competitiveness and other stats? If so, LongTailPro will analyze those under-the-radar information within a few minutes. Check Domain Name availability: Did you use online domain checker tools so far? So after today, you don’t need to use any online domain name availability checker tools to find available domain names. LTP will check and inform you whether any lop level domain is yet to purchase. It is a very useful tool to find domain names for niche websites. Keyword Difficulty Check: Just Like in SEMrush keyword difficulty tool, there is a feature in LTP to check the keyword competitiveness. So you can determine which keywords are easier to rank on search engines. Find Long Tail High CPC keywords: Do you want to find $100+ CPC keywords to boost your Google Adsense earnings? So by using the filter options, you can find high converting, easy to rank and high CPC keyword phrases very easily. Favorite Keywords: If you found a special keyword which may have a high CPC value, low keyword competition score etc, for your future uses, you can favorite/highlight them. As you noticed in above LongTailPro features, LongTail Pro is a complete long tail keyword research tool. Because Long Tail Keywords contributes to more than 70% of global monthly searches, you shouldn’t ignore the importance of long tail keywords in search engine optimization. And also Long Tail keywords converts 2.5 better than short tail keywords. That’s why professional bloggers such as Pat Flynn recommend LongTail Pro. As a desktop SEO program, LongTailPro has a few features which you shouldn’t overlook. I will explain a bit more about a few essential features of LongTailPro. This is where your keyword research starts. One big reason why you find best keyword research software is to find seed keywords. With LTP finding seed keywords is really simple. But, I want you to pay your attention to the filter section. This is where the tasty-fruits hanging on. Do you want to generate keywords which have $100+ CPC value? Or do you want generate long tail keywords with 5+ word length? Or want find low competitive long tail keywords with a minimum X global monthly searches? These are really simple tasks for LongTailPro. By default, LongTail Pro results page includes a few columns such as keywords, Average CPC, Local searches, Global searches and Monthly searches. You can add additional data such as available domain names, Google and Bing title competition in the filter section. 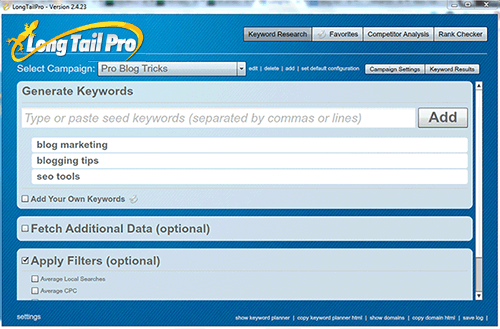 Competitor AnalysisI think the most useful feature of the LongTailPro is the finding seed keywords. Because every blogger wants to find low competitive long tail keywords which bring leads and sales. I have published a complete guide on How to Find competitors SEO keywords with SEMrush search engine marketing tool a few months ago. I got really good feedbacks to that post. However, SEMrush is not a desktop SEO tool. So you have to log into SEMrush to analyze your competitors. But, LongTail Pro has an inbuilt tool to analyze competitors’ websites and web pages important stats. To use this feature, you should have a MOZ (earlier SEOmoz) API key and Access ID. By using the Moz API, you can fetch any website’s important data such as Page authority, inbound links, domain authority, MozRank, Google PageRank and website age etc. You can get a Moz access ID & an API key by creating a free MOZ account over here. I like Long Tail Pro’s competitor analysis feature very much, because you can check multiple web pages’ stats at once. When you’re in a competitive niche, you know that to rank for any keyword on the top of the SERPs, you should build high-quality backlinks. If there is an authoritative website, such as Wikipedia, Inc.com ranking on the first page, it becomes more difficult to rank that keyword on the SERP. But, with LongTail Pro, you can analyze SERP for any location in any language to check top 10 result’s web page statistics. This is how I was able to increase traffic of my blog posts. As this blogging strategy, I was able to rank some of blog posts on the Google’s #1 position for competitive keyword phrases.As a blogger and a small business owner, you should always check current search engine result pages (SERPs) for your target keywords. If you found there are no big competitors ranking on the first page, you can go up with the keyword. LongTail offers two versions of its software: LongTail Pro and longTail Platinum. LongTailPro only charges one-time $97. But, LongTail Platinum additionally charges $17/month. However a few important features such as checking keyword competitiveness, favorite keywords and import up to 10,000 keywrods at once you can’t get on LongTail Pro version. So let me explain what are those premium features on Long Tail Platinum and how they work. Note: When you buy LongTailPro, you should choose the LongTailPro + Long Tail Platinum package, as the first month is complete free and if you don’t like to continue with LongTail Pro platinum package, you can disconnect your monthly subscription and use LongTail Pro as it is. This is one of the useful features in LongTail Platinum. You can find the keyword competitiveness (in SEMrush, it’s keyword difficulty) which shows the difficulty of ranking for the particular keyword. This feature would help you pick up best keywords which are very easy to rank for and in sometimes you can predict your SERP positions! In LongTail Platinum, you would find the Avg KC (average keyword competitiveness) column at keyword research and competitor analysis page. Now, you would be able to find keywords with ranking potential. The software has its own internal algorithm which uses the different metrics to calculate the keyword competitiveness score. But, with a single click, you can get the keyword competitiveness of each keywords very easily. If your keyword strategy is well-organized, you would find low competitive targeted keywords. LongTailPro Keyword Rank Checker feature lets you find the keyword rankings of root domains or partial URLs on Google, Bing, and Yahoo! Search engines. There is no any keyword limit or URL limit. So the sky is the limit! Therefore, you can check multiple keyword rankings of different URLs once. Pro tip: Analyze top 10 results of Google for your target keyword using the competitor analysis tool and next input those landing pages into the rank checker tool. Then start targeting other keyword phrases to know their rankings. It’s a good way to find the weak points of your competitors. Alternatively, you can use the SEMrush page audit tool to find the weak points of your competitors websites as well. To Learn more about SEMrush, check out this SEMrush review post. Speed: I am not talking about the speed of LTP software. I know it loads quickly because it’s just a 6MB software. I mean the speed is that LTP saves lots of time. Think how much time it would take to find the page authority, domain authority, Pagerank and domain age of multiple domains. I would take for them hours. But, Luckily, with Long Tail Pro SEO tool, you can speed up the process and save your valuable time, efforts. Simplicity: Although LongTailPro provides you many statistical data, behind the simple interface, it runs hundreds of calculations and algorithms which provide clear and correct results in no time. It would take a few minutes, if you set up the time gap between two Google requests. Despite that Long Tail Pro is a simple, yet a powerful SEO software. Customer Support: When it comes to online marketing, maintaining a good customer support service is essential. Else people could find that Long Tail Pro is not the software they were searching. But, Long TailPro team is doing a great job at helping customers to solve their problems. In some cases, they help people through Skype too. A complete Long Tail Keyword research tool: LongTailPro and LongTailPlatinum have all the features you want to find perfect keywords which could bring you more customers since the first day. Give it a try. You would see a great increase of your traffic reports and income reports as well. Doesn’t run on Linux based Computers: Well, more than ninety percent of marketers and SEOs use Windows and Mac computers. But, there are a few bloggers who use Linux OS based computers. So why does LTP not support for those operating systems? It’s a software: This could be one of the biggest cons of Long Tail Pro. As mobile devices are going to be more popular in every day, many bloggers use from tablet PCs to smart phones to conduct their business activities. As they can’t access to LongTailPro, this could be a big reason for people not using LTP. But, they could create an application for mobile devices, so they can feel the experience of Long Tail Pro in their mobile devices too. As I said earlier in the Long Tail Pro review, this SEO tool is a premium SEO software for computers. Basically, there are two packages which have different charging options. LongTail Pro is a one time offer $77 ($97) (with below discount link) while LongTail Pro platinum package charges an additional $17 monthly fee. Here’s the LongTailPro pricing tags in visually. LongTailPro is an essential SEO tool that should have in your SEO arsenal. As a blogger, I highly recommend you to at least test drive LongTailPro for next 10 free. Within that time period, you would get lots of benefits only through the keyword research tool. But, if you are going to buy LongTailPro product, I have a great deal for you. If you buy the LTP through my affiliate link below, you would get a $20 discount. When you buy Long Tal Pro through my affiliate link, I will get a small commission, but you won’t charge any additional fee. When you are going to purchase LongTail Pro, I recommend you to use this coupon code or buy LongTailPro + Platinum package as you can get 30 days free platinum features. It doesn’t matter which your niche is. If you want to rank your web page on search engines and drive targeted traffic, so you should pay your attention to keyword research. Keyword research doesn’t perfect without quality keyword research tools. As the usage of Long Tail Keywords is the best way to rank on the first pages of SERPs, you shouldn’t ignore the importance of Long Tail Keyword research. Undoubtedly, Long Tail Pro is the best keyword research software, best niche keyword research tool. If you have a blog which you monetize through Google Adsense, you can find high CPC keywords very easily. Professional bloggers such as Pat Flynn from SmartPassiveIncome.com use LTP as their main SEO tool to find untapped long tail keywords which bring them lots of targeted traffic which eventually convert into customers. So why are you still waiting? Didn’t you still download LongTailPro free for next 10 days? Here’s the link again. Go ahead and use the LongTailPro tool right away. If you’re an existing user, I would like to know your feedback and reviews about Long Tail Pro in the comment section below. How do you use LongTailPro for your business? What are the outcomes of LongTail Pro? Anyone who is struggling with keyword research and finding niches. Freelancers who are suffering from readers-block and finding it difficult to come up with profitable keywords. Busy marketers who want to save tons of time while doing what they want to do. Newbies and Pros alike, anyone can use LTP and benefit from it. SEOs who are struggling to rank web pages on search engines. Bloggers who are not affordable to purchase premium high-end products and SaaS. Niche-marketers who want to find profitable niches which make them money. Bloggers whose websites don’t make them money, not converting people into subscribers and customers. Market Samurai affectionados that want a quicker, handy tool, with a modern and comfortable interface. Every e-marketers who want simple, yet powerful SEO desktop tool. Can I Install LongTailPro more than one PC? Yes, you can and their customer support explains how. Do I really need the platinum version? As my opinion, yes. You should buy the platinum version as it saves lots of time and has the best features included. Which is better Long Tail Pro or Market Samurai? One most asked questions about LTP is the difference Long Tail Pro vs Market Samurai. Here’s what LongTail Pro’s developer, Spencer Haws had to say about LongTailPro and Market Mamurai. The primary difference is that LongTailPro is a big time saver over MS. With LongTail Pro you are able to enter in multiple seed keywords at once (rather than just 1 with MS). So, instead of entering in 1 seed keyword, waiting five minutes, then going back and entering in one more; you can enter 5 seed keywords (for example), hit generate and then see all the keyword ideas at once! You can also PRE-filter your keywords (so you are only left with keywords that meet your CPC, search volume, or other criteria). Another big time saver. Finally, you can automatically check for exact match domains (rather than checking just one at a time with MS). There are other differences, but in reality I created LongTailPro because I was unhappy with Market Samurai, so I specifically created it to improve on the areas that MS was lacking. Hi Chamal, I love the way of your blogging. You've done a great job via writing an highly valuable post on LTP. I've also launched a similar tool for long tail keywords. You can check it out here http://keywordsnatcher.org . I hope it deserve some space here or in your upcoming posts related to keyword research topics. Hi Sarah, i will mention about your keyword research tool in my upcoming posts. Thanks for your appreciative comment. Hope you'd enjoyed reading this LongTail Pro platinum review.